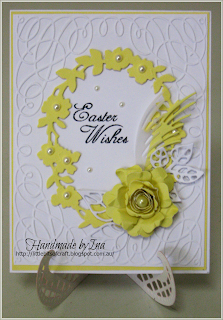 I used a digi from Stitchy Bear Digital Outlet coloured using Promarkers and matted onto gold mirri card. I've used die cuts from Elizabeth Craft and Sue Wilson along with a cropped image from the Joanna Sheen/Pamela West CDRom to make this Easter card. 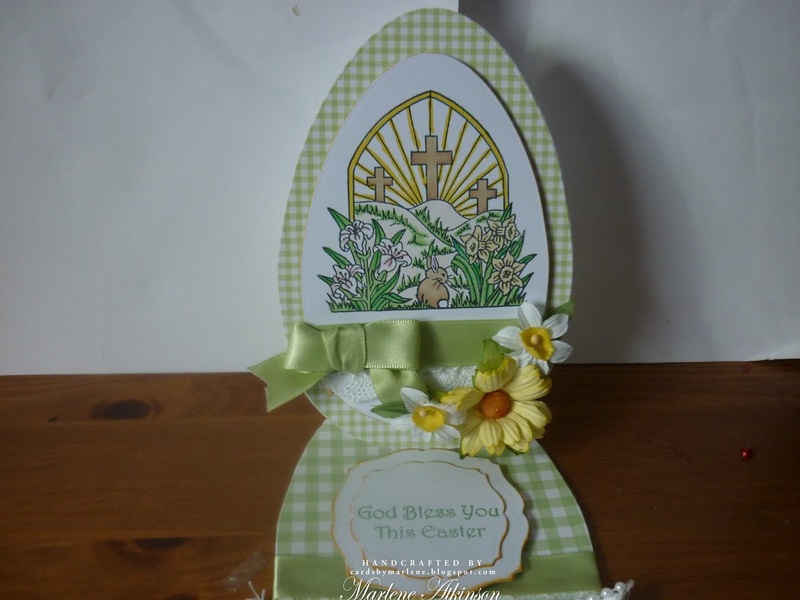 I used an image from the Paper Shelter for my Easter card. 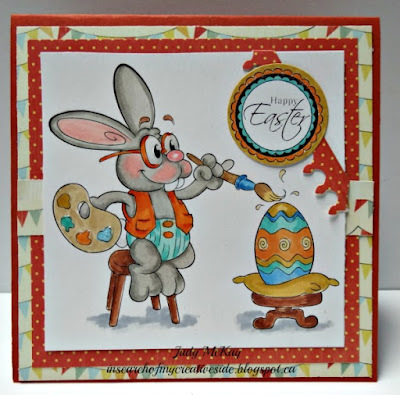 I loved the image of the rabbit painting the Easter egg. 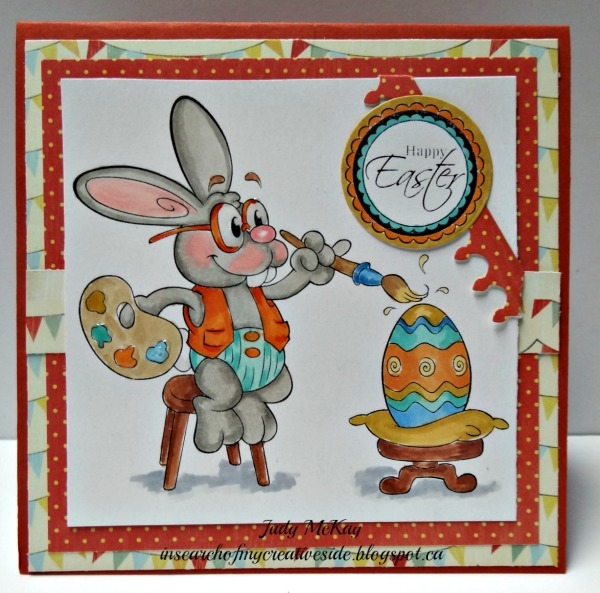 I used Diamond Glaze on the rabbit's glasses and the paint splotches to give the card some shine. 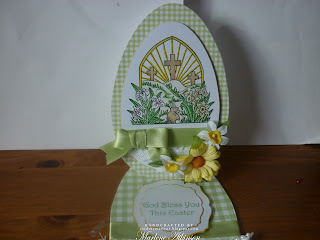 To complete the card I used die cuts for the banner and a rubber stamped sentiment. A CAS card with Easter Wishes featuring embossing and dies. 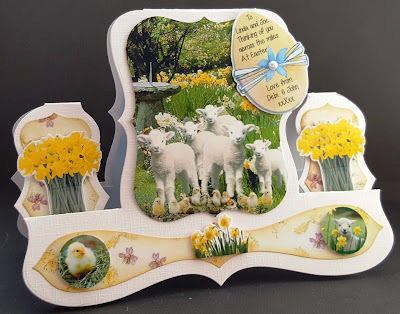 I have used a tattered lace stepper card die and decorated it with images I created using my Serif Craft Artist 2 programme - backing paper was from a kit I had in my stash. 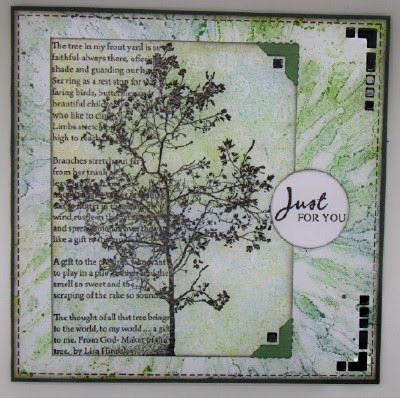 I have used all Stampin Up! supplies except for my Copics to make this sweet little chick card. 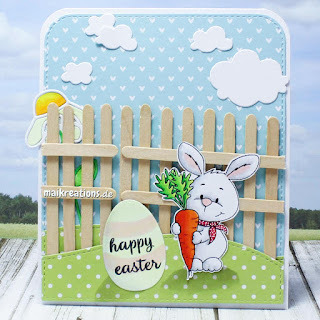 This sweet image is from My Favorite Things and is called Somebunny and is my first try at a one layer card. I made this card for my granddaughter, Caydence. 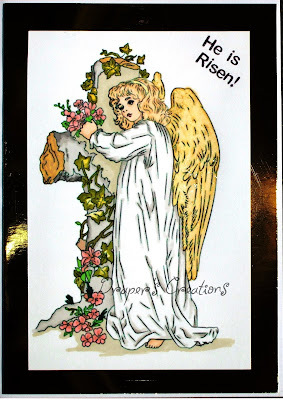 I was enchanted by this sweet, soft card. Janny, this background is just amazing. 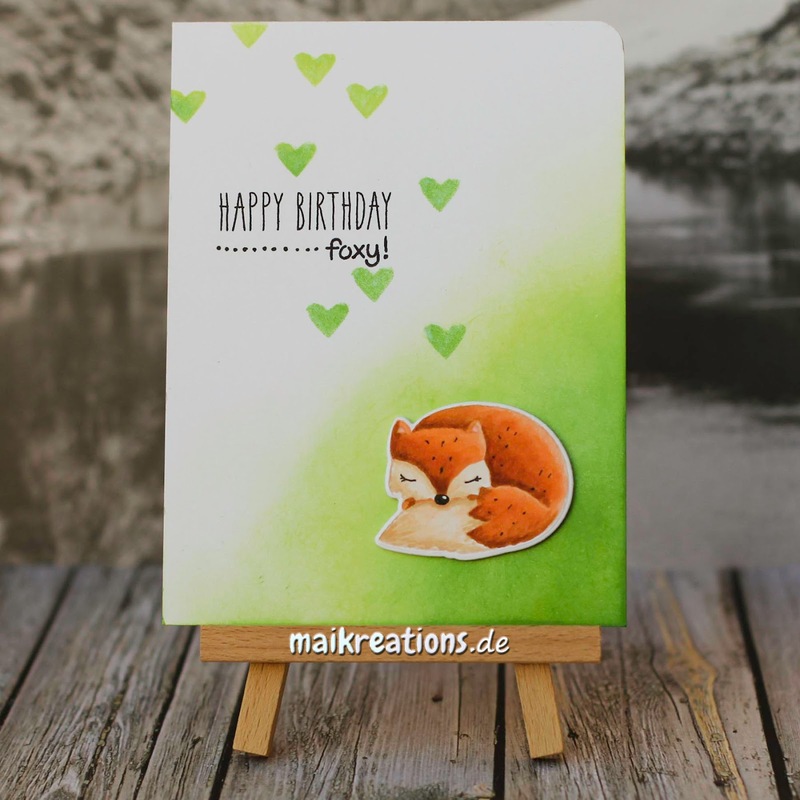 This is just too cute and lovely use of green. 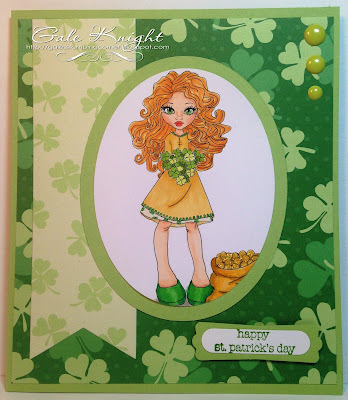 Couldn't resist the red hair and shamrocks! 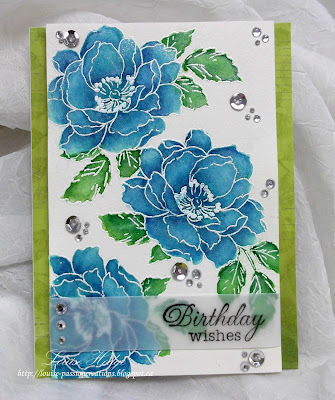 A lot of nice techniques used on this card. Love the shamrock as the center of attention. Amazing background using Color Burst! This was a wonderful challenge with a lot of awe inspiring entries. Thank you so much for joining us for this challenge. It was an honor to host, but very difficult to choose as there were so many lovely entries. 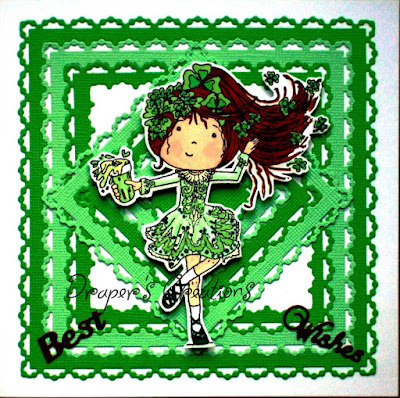 I love St. Patrick's Day and am very happy to share this sweet little image from Pure Innocence. I am looking forward to seeing all your beautiful creations this challenge. A birthday card for my son. 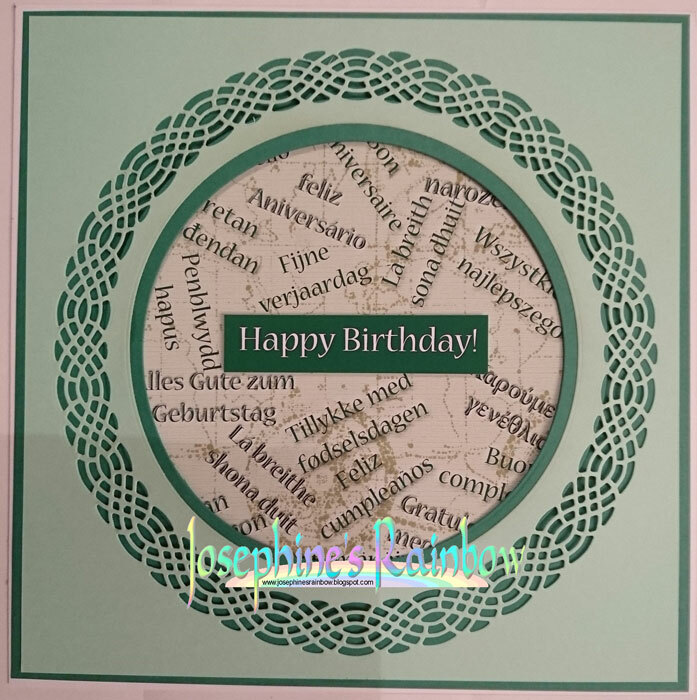 He's a bit of a linguist, and so birthday greetings in various European languages seemed like a good idea. 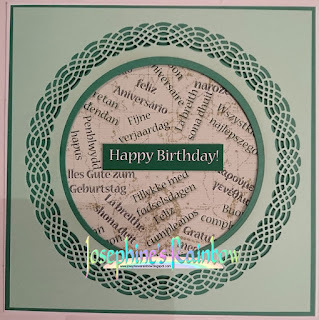 The various greetings were translated using Google Translate, assembled in Photoshop Elements and the card was completed with some rubber stamping and die cutting. 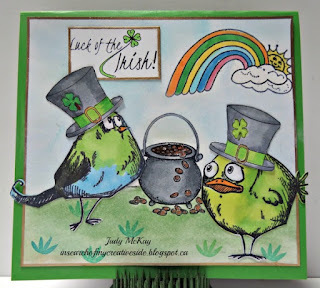 I made this St. Patrick's Day card for my grandson. 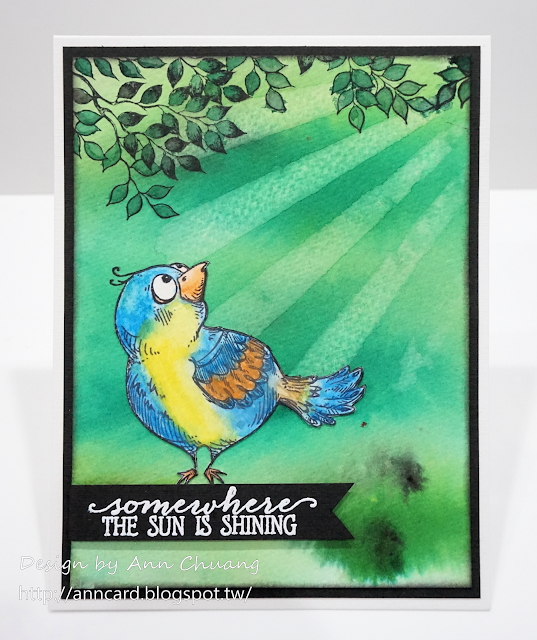 I thought he would think the crazy bird stamps from Tim Holtz were cute. I cut out some Irish hats, stamped a rainbow and a pot of gold. 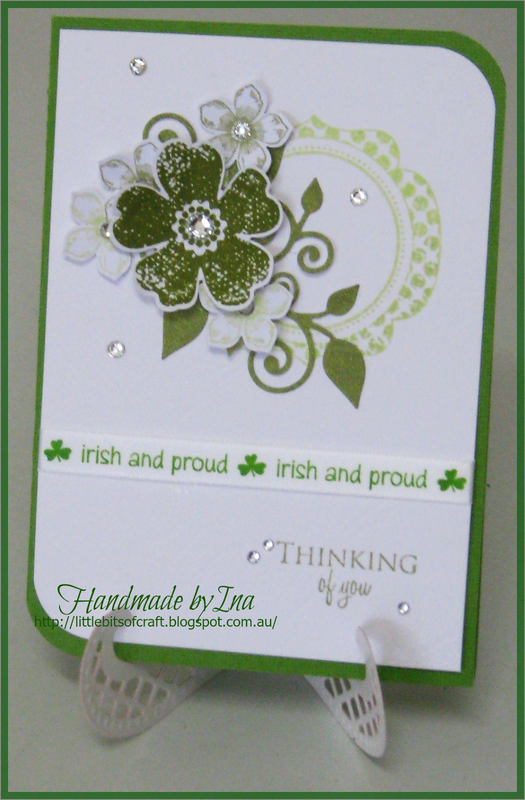 I completed the card by adding some grass and a Irish sentiment. I went all GREEN for my card and finished off with Irish Ribbon. My grandparents were of Irish decent and I was lucky enough to visit Ireland some years ago. Such a beautiful place and so GREEN! I thought about a nice green meadow when I read the title for this challenge. I used Distress Inks to create the background and the cute fox is from a set by Mama Elephant. 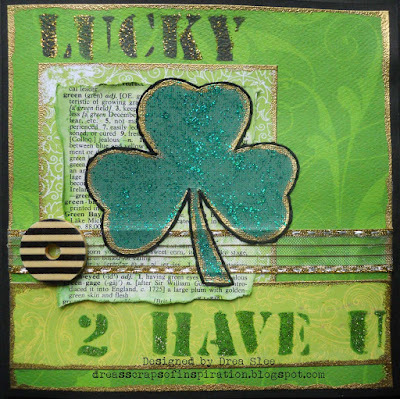 I used the Tatty Twinkles stamp called St. Patrick's day and attached it to a background of alternating tones of green frames cut using Tattered Lace dies. I'm not sure that I know anyone that celebrated St Patrick's Day so I went with the 'Go Green' colour option. I had a piece of background paper left over from an earlier project so decided to use that and cut out the butterfly too. I have a friend who lives in Ireland and I am sure she would love this. I have stencilled and stamped and die cut the various items on my card. 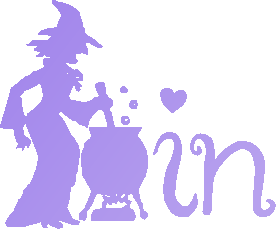 Please see my blog for details. 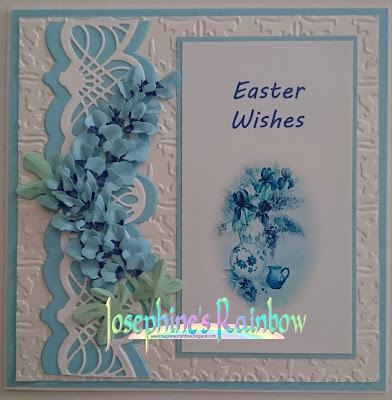 I have made the background with an embossing folder and used a Clearly Besotted Stamp and the sentiment came with the same set. 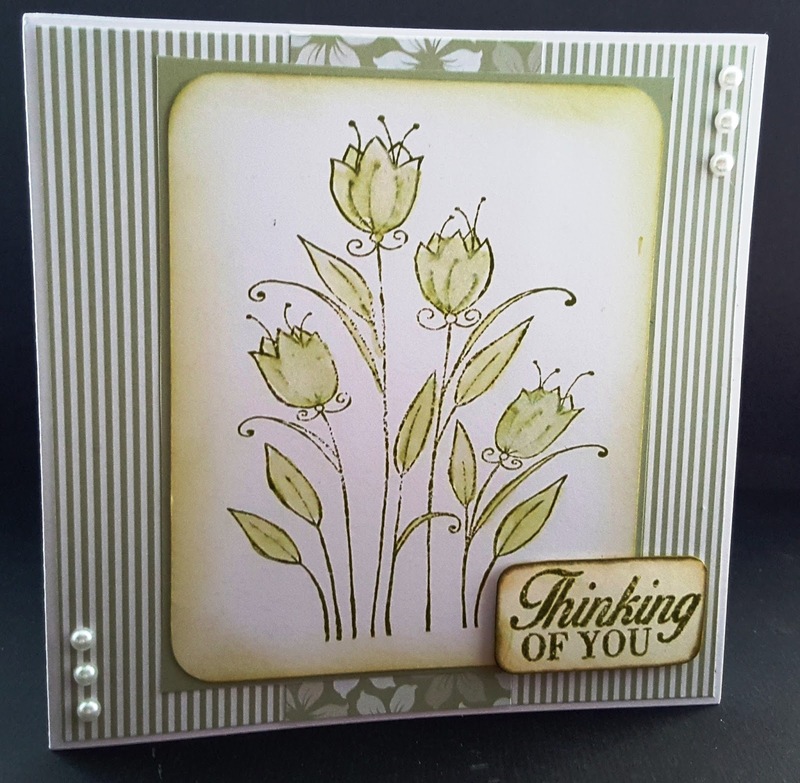 I used 'Bundled Sage' Distress ink, an embossing folder, stamps my Silhouette and some paper clay roses to make my Green themed card. 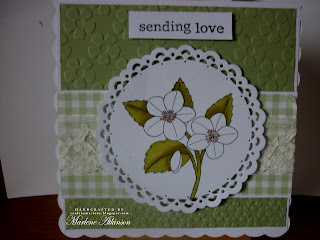 I have used a soft minty green for this new baby card and a gorgeous flair from Funky Flair Studio. 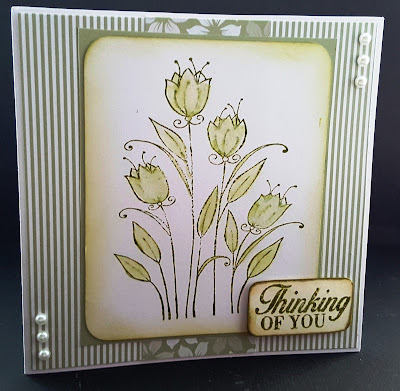 I used one of my favourite Woodware stamps to make this sympathy card - backing papers were from a Dreamees cd and I used distress ink to stamp and colour the image. This was just enchanting Jana. The little pond, the gorgeous swing... all fabulous! Please contact me at the address in the sidebar. Oh my another complete stunner. 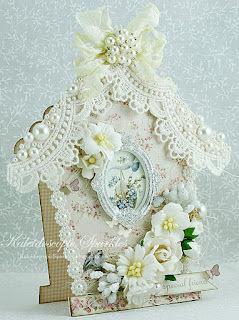 Love all the work that has gone into this, the texture paste, all the gorgeous 3 dimensional aspects too. 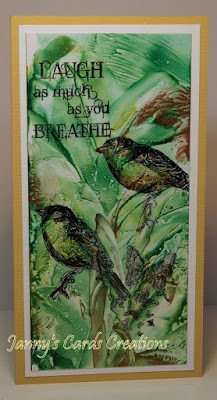 For a new watercolourer, this was so beautifully shaded! This was made for a blind lady..... and whilst we can appreciate it's beauty by looking at it, she will have enjoyed all the lovely things she can feel, the tactile aspect of it! 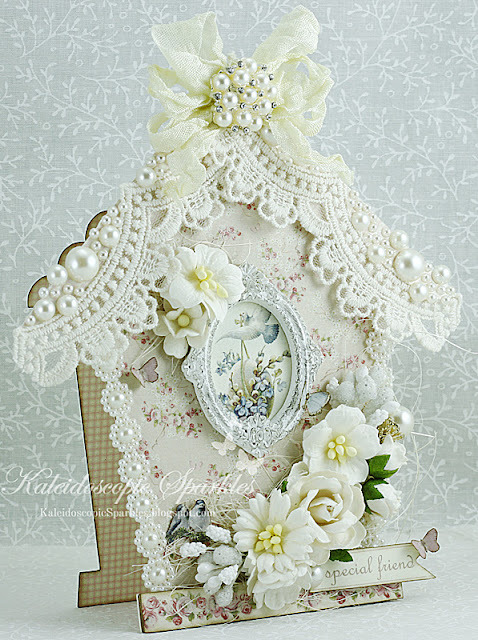 Gorgeous shabby chic design, with such a pretty central topper with the floral arrangment and the butterflies! Amazing colouring! The muslin looks like the foam atop the waves! Congratulations to you all. 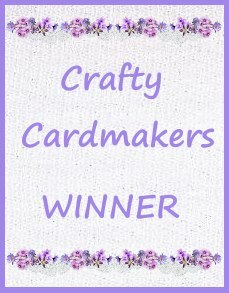 Would the winner please contact me using the address in the side bar. Don't forget to collect your badges from the sidebar, and we look forward to seeing you back here at 12 Noon for our new challenge.